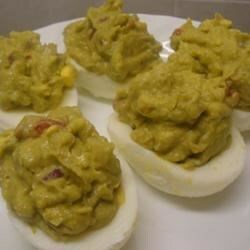 "I got this great alternative to deviled eggs from my brother Mark. I've taken this recipe to the office and family gatherings and they ask for me to bring to every occasion." Place eggs in a saucepan and cover with cold water. Bring water to a boil and immediately remove from heat. Cover, and let eggs stand in hot water for 10 to 12 minutes. Remove from hot water, cool, and peel. Slice eggs in half, and remove yolks to a mixing bowl. In the bowl with the yolks, combine the avocado, cilantro, green onion, and jalapeno. Stir in the lime juice, and season with salt, hot sauce, Worcestershire sauce, and mustard. Mix well, and fill empty egg white halves. Chill until serving. Sprinkle with paprika just before serving. I love avacados but two seemed a little much for only four eggs, therefore, I only used one. They turned out great and everyone loved them! It was very good, however it's mostly like guacamole in eggs. If you like that you'll like these. I garnished with a dab of sourcream and an olive slice. They were pretty that way. While these were good, they need a few changes to be delicious. Next time I prepare these, I'll add some finely minced garlic and extra jalapeno and cilantro. I thought this was great and unusual. However, my wedding was on July 4th and they do turn brown. If anybody comes up with any ideas to keep this from happening, let us know.